Mrs. Lao, 78 years old, is lately experiencing blurring of her vision. She also complains of experiencing glares and halos whenever she looks at bright lights even for a split second. She ignored all of these, attributing them to tiredness. After a month, she consulted a physician because the lens of her eye now has a milky center. She was diagnosed with senile cataract. One of the most common eye disorders is cataract. A cataract is a lens opacity or cloudiness. On visual inspection, the lens appear gray or milky. The three most common types of senile cataracts are defined by their location in the lens. Nuclear cataract. A nuclear cataract is caused by central opacity in the lens and has a substantial genetic component. Cortical cataract. A cortical cataract involves the anterior, posterior, or equatorial cortex of the lens. Posterior subcapsular cataracts. Posterior subcapsular cataracts occur in front of the posterior capsule. 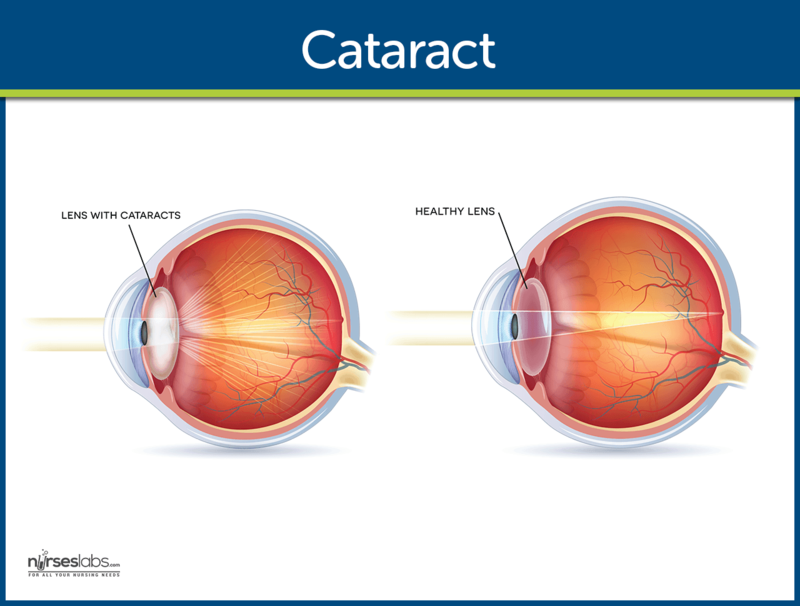 Cataracts can develop in one or both eyes at any age as a result of a variety of causes. Lifestyle. Factors that increase the risk of cataracts are cigarette smoking, long-term use of corticosteroids, sunlight and ionizing radiation, diabetes, obesity, and eye injuries. Research. Recent studies have linked cataract risk to lower income and educational level, smoking for 35 or more pack-years, and high-triglyceride levels in men. Myopia. Nuclear cataract is associated with myopia, which worsens when the cataract progresses. Density. If dense, the cataract severely blurs vision. Cataract in the periphery. A cataract in the equator or periphery of the cortex does not interfere with the passage of light through the center of the lens. Catatact ranks behind only arthritis and heart disease as a leading cause of disability in older adults. Cataracts affect nearly 20.5 million Americans who are 40 years of age or older, or about one in six people in this age range. By 80 years of age, more than half of all Americans have cataracts. According to the World Health Organization, cataract is the leading cause of blindness in the world. Almost one in five people between the ages of 65 and 74 develop cataract severe enough to reduce vision. Degenerative changes. Senile cataracts develop in elderly patients, probably because of the degenerative changes in the chemical state of lens proteins. Foreign body injury. Traumatic cataracts occur after a foreign body injures the lens with sufficient force to allow aqueous or vitreous humor to enter the lens capsule and also dislocate the lens. Secondary effects. Complicated cataracts occur as secondary effects in patients with uveitis, glaucoma, or retinitis pigmentosa, or in the course of a systemic disease, such as diabetes, hypoparathyroidism, or atopic dermatitis. Because all light entering the eye passes through the lens, any clouding of the lens can cause poor vision. Blurred vision. Blurred vision is usually the first symptom of cataracts. Glare. Glare refers to the pain felt when the patient looks directly into the light. Halos. Halos are formed when the patient looks at a bright light and there is still the vision of the light after looking away. Double vision. Double vision is also one of the early symptoms of cataract. Quit smoking. The patient should avoid smoking because it is one of the greatest contributing factors to cataract. Wear sunglasses. Wearing of sunglasses shields the eye from too much exposure to UV rays that predisposes to cataract. Retrobulbar hemorrhage. Retrobulbar hemorrhage can result from retrobulbar infiltration of anesthetic agents if the short ciliary artery is located by the injection. Acute bacterial endophthalmitis. Devastating complication that occurs in about 1 in 1000 cases. Toxic anterior segment syndrome. Non-infection inflammation that is a complication of anterior chamber surgery. Decreased visual acuity is directly proportionate to cataract density. Snellen visual acuity test. The Snellen visual acuity test measures the degree of visual acuity in the patient. Ophthalmoscopy. Ophthalmoscopy is used to view the extent of cataract. Slit-lamp biomicroscopic examination. This procedure is used to establish the degree of cataract formation. No nonsurgical treatment cures cataracts or prevent age-related cataracts. Dilating drops. Dilating drops are administered every 10 minutes for four doses at least 1 hour before surgery. Antibiotic drugs. Antibiotic drugs may be administered prophylactically to prevent postoperative infection and inflammation. Intravenous sedation. Sedation may be used to minimize anxiety and discomfort before surgery. Phacoemulsification. A portion of the anterior capsule is removed, allowing extraction of the lens nucleus and cortex while the posterior capsule and zonular support are left intact. Aphakic glasses. In aphakic glasses, objects are magnified by 25%, making them appear closer than they actually are. Contact lenses. Contact lenses provide patients with almost normal vision, but because contact lenses need to be removed occasionally, the patient also needs a pair pf aphakic glasses. IOL implants. The most common IOL is the single focus lens or monofocal IOL that cannot alter the visual shape; multifocal IOLs reduce the need for eyeglasses; accommodative IOLS mimic the accommodative response of the youthful, phakic eye. Extracapsular cataract extraction (ECCE). ECCE removes the anterior lens and cortex, leaving the posterior capsule intact. Intracapsular cataract extraction. This procedure removes the entire lens within the intact capsule. The patient with cataract should receive the usual preoperative care for ambulatory surgical patients undergoing eye surgery. Recent medication intake. It is a common practice to withhold any anticoagulant therapy to reduce the risk of retrobulbar hemorrhage. Preoperative tests. The standard battery of preoperative tests such as complete blood count, electrocardiogram, and urinalysis are prescribed only if they are indicated by the patient’s medical history. Vital signs. Stable vital signs are needed before the patient is subjected to surgery. Visual acuity test results. Test results from Snellen’s and other visual acuity tests are assessed. Patient’s medical history. The nurse assesses the patient’s medical history to determine the preoperative tests to be required. Disturbed visual sensory perception related to altered sensory reception or status pf sense organs. Risk for trauma related to poor vision and reduces hand-eye coordination. Anxiety related to threat of permanent loss of vision/independence. Deficient knowledge regarding ways of coping with altered abilities related to lack of exposure or recall, misinterpretation, or cognitive limitations. Regaining of usual level of cognition. Recognizing awareness of sensory needs. Identifying potential risk factors in the environment. Appearing relaxed and reporting anxiety is reduced at manageable level. Identifying healthy ways to deal with and express anxiety. Providing preoperative care. Use of anticoagulants is withheld to reduce the risk of retrobulbar hemorrhage. Providing postoperative care. Before discharge, the patient receives verbal and written instructions about how to protect the eye, administer medications, recognize signs of complications, and obtain emergency care. Regained usual level of cognition. Recognized awareness of sensory needs. Identified potential risk factors in the environment. Appeared relaxed and reporting anxiety is reduced ti a manageable level. Identified healthy ways to deal with and express anxiety. Activities. Activities to be avoided are instructed by the nurse. Protective eye patch. To prevent accidental rubbing or poking of the eye, the patient wears a protective eye patch for 24 hours after surgery, followed by eyeglasses worn during the day and a metal shield worn at night for 1 to 4 weeks. Expected side effects. Slight morning discharge, sone redness, and a scratchy feeling may be expected for a few days, and a clean, damp washcloth may be used to remove slight morning eye discharge. Notify the physician. Because cataract surgery increases the risk of retinal detachment, the patient must know to notify the surgeon if new floaters in vision, flashing lights, decrease in vision, pain, or increase in redness occurs. Individual findings, noting specific deficit and associated symptoms, perceptions of client/SOs. Use of safety equipment or procedures. Level of anxiety and precipitating/aggravating factors. Client involvement and response to interventions, teaching, and actions performed. "I will sleep on my left side after surgery." "I will wipe my nose gently if it is congested after surgery." "I will call my physician if I have sharp and sudden pain or a fever after surgery." "I will bend below my waist frequently to increase circulation after surgery." D: Immediately after the procedure, the client should avoid bending over, to prevent putting extra pressure on the eye. A: Sleeping on the left side avoids injuring the operated side. B: Wiping the nose gently avoids increasing the intraocular pressure. C: The patient must recognize any signs and symptoms of complications. Maintain bed rest for 1 week. Lie on his or her stomach while sleeping. Avoid bending his or her head below the waist. Lift weights to increase muscle strength. C&B: Bending the head below the waist and lying on the stomach increase the intraocular pressure and affect the newly operated eye. A: Bed rest for a week is unnecessary for post cataract surgery patients. D: Lifting heavy objects ate contraindicated after a cataract surgery. D: Pain is not present in cataract; only in glaucoma. A, B, C are the three common symptoms found with cataract. C: The lens of the eye turns milky white in cataracts, and this is the major objective finding seen. A&D: Tunnel vision and eye pain are common in patients with glaucoma. 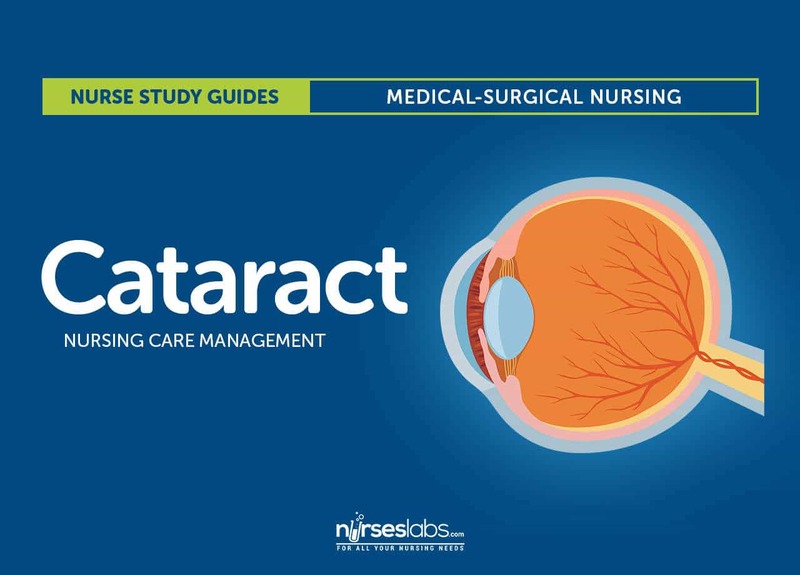 B: Patients with cataracts experience glare, but this is not a major finding in cataract. Getting up from bed for 2 weeks after surgery. Chewing on the same side of the operated area. Using eye glasses when going outside. C: Taking anticoagulants predisposes the patient to hemorrhage A&B: Complete bed rest for 2 weeks and chewing on the side of the operated area unnecessary for a post cataract surgery patient D: The sunglasses protect the eyes from potential infectious agents such as dust and smoke. A. Maintain bed rest for 1 week. B. Lie on his or her stomach while sleeping. C. Avoid bending his or her head below the waist. D. Lift weights to increase muscle strength. A. Getting up from bed for 2 weeks after surgery. B. Chewing on the same side of the operated area. D. Using eyeglasses when going outside. D: Immediately after the procedure, the client should avoid bending over, to prevent putting extra pressure on the eye. A: Sleeping on the left side avoids injuring the operated side. B: Wiping the nose gently avoids increasing the intraocular pressure. C: The patient must recognize any signs and symptoms of complications. 2. Answer: C. Avoid bending his or her head below the waist. C & B: Bending the head below the waist and lying on the stomach increase the intraocular pressure and affect the newly operated eye. A: Bed rest for a week is unnecessary for post cataract surgery patients. D: Lifting heavy objects ate contraindicated after a cataract surgery. 3. Answer: D. Eye pain. D: Pain is not present in cataract; only in glaucoma. A, B, C are the three common symptoms found with cataract. 4. Answer: C. Opaque lens. C: The lens of the eye turns milky white in cataracts, and this is the major objective finding seen. A & D: Tunnel vision and eye pain are common in patients with glaucoma. B: Patients with cataracts experience glare, but this is not a major finding in cataract. 5. Answer: C. Taking anticoagulants. D: The sunglasses protect the eyes from potential infectious agents such as dust and smoke.